Tricky maths in Australia. Should we save $800 million dollars and get stable cheap modern electric power or give that money to renewables giants to help them compete with our fifty year old coal fleet and get us 0.0001% better weather in 2100*? Hmm. What to do?! A new HELE Coal plant (also known as an Ultra Super Critical — USC– coal generator) would cost $2.2 billion. We currently pay $3b a year in renewables subsidies. A modern coal plant would make 1,000MW of electricity 24 hours a day (and stabilize the grid for free). Renewables subsidies get us free electricity at random moments which we may or may not need, they need expensive gas back up, and add enormous costs to stabilize the grid. If we get one modern hot coal plant we might catch up to countries like Indonesia, and Malaysia, though we’ll still be far behind India and Japan, which is building 45 USC plants. As of May 2017, China has at least 90 USC plants. The USA has one. What does an “advanced economy mean”? The Minerals Council of Australia produced detailed costings of electricity production. Ignore the CCS fantasy stats. 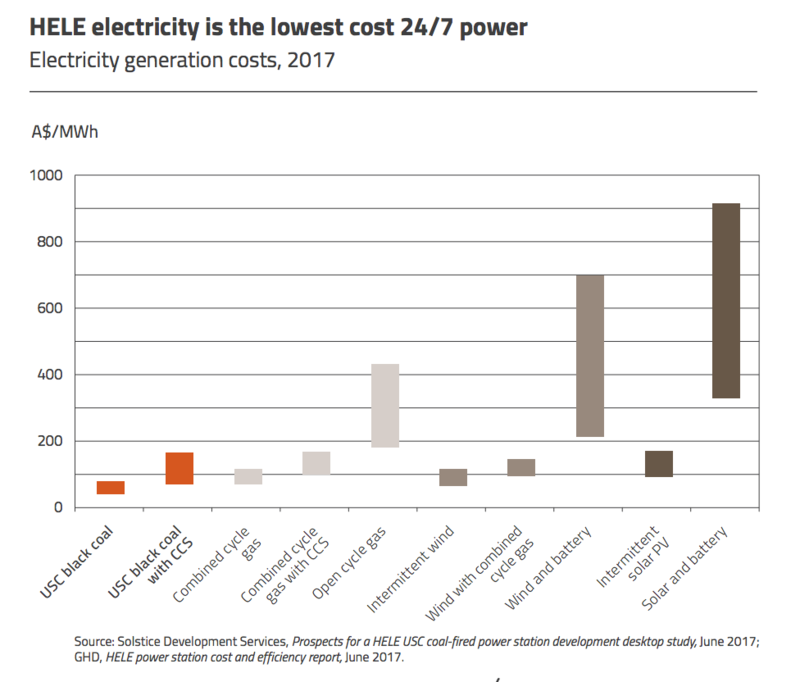 USC coal plants are the lowest cost generation option at $40-$78 per MWh in (2017 prices) on a long run marginal cost basis. Variable renewable energy (VRE), which is not available 24 hours a day, also has higher costs, including solar at $90-$171 per MWh and wind at $64-$115 per MWh. Reducing greenhouse gas emissions is important and replacing the existing coal fleet with HELE technology would save 44.2 million tonnes of CO2 or over 25 per cent of National Electricity Market coal generation emissions. At an individual power station level, with the future adoption of CCS, emissions intensity of USC plants would fall from 0.773 to 0.106 tonnes CO2/MWh. So that’s a 25% reduction in our CO2 emissions from coal if we converted all our coal plants to USC. The Greens, of course, will hate it. With up to 1200 HELE plants being planned or built in Asia, and similar technology anchoring electricity production in Japan and Germany, senior government MPs, including Mr Abbott, have backed investment in coal-fired energy. *0.0001% Better weather? OK, fair cop, this may be a wildly optimistic estimate. If the world cools, reducing CO2 may make the weather worse. 142 comments to Pop Quiz: To get cheaper electricity should we build a/ new coal plant, or b/ pay $3b in renewable subsidies? With regard to the question in your headline, do we really need to reply – grin. It would be fun to ask patrons at an inner city cafe. Do you mean the turkeys who once wanted dibydrogen monoxide banned? It’s all about feelings. Nothing else matters in today’s world. Rubbish. A coal plant is obviously dirty and will create millions of climate refugees which will cost many billions. Green subsidies are clean money, and besides a subsidy isn’t a tax. Taxes are bad, Green subsidies are good. Why is this so hard for climate deniers to understand? We need to identify, specifically, who wants the Western industrialized countries to become second-rate compared to the Orient. In our own countries, it is obviously the Insane Left (my term for what they have been since Obama first became President in 2008). The degeneration apparent in the flight of large western companies to the Orient over the last two generations is apparently too slow for them, because “climate change” and the destruction of our energy grids is being pushed at a much faster rate. Somebody wants this treason done NOW. Insane Left (my term for what they have been since Obama first became President in 2008). I’m an old-fashioned moderate and thinking (not contradictions, just -rare-) green – clean up the processes we have, stop ‘wasting” land on stupid ill-thought-out ideas (like biofuels, windmills, solar panels) and destructive processes (put industry back into the cities, where the jobs are needed) GMOs are fine by me, as long as pig looks like a pig, tastes like a pig, and is mostly pig DNA wise (especially as far as my digesting of it goes), it can glow or bark or fly, I don’t care. If adding a dry-land grass or harmless virus snippet of DNA means corn, or beans, or wheat, any plant we can eat, grows better, is attacked by fewer pests, and is nutritious and tastes like it’s supposed to, again, I don’t care. Stupid greens say no to vitamin A enhanced rice, but will eat plastic-tasting tomatoes if certified organic – even tho the taste has been bred out of them in exchange for ripening and lasting longer off-vine. But I don’t believe in CO2 as the control knob of climate, I doubt humanity has made that much of an impact on the climate at all, and I don’t want to live hand-to-mouth, foraging for greens and the odd squirrel for dinner, huddling around a big fire or in a heap of people, draped in furs, blankets, whatever is left after the shops shut down and people realize that hey, it is -hard- to grow, harvest, prep and weave fur/fiber into cloth and clothing and the warmer areas have closed to their borders to those from the cold, even frigid, lands so as to preserve the ability to provide food stuffs and shelter for themselves. But, I also don’t want to wade a creek and have my legs stained orange (southern Ohio, rust from the mines, happened to me) or die of a weird skin disease (hasn’t happened to me)(untreated sewage, biochemicals, caustics, acids, radioactives) or wake up and find I need a mask and a tank to breathe, either. So some stuff needs to be kept “clean,” and regulated to ensure it’s clean – because we can’t trust the manufacturers, refiners, industrial behemoths, to do so on their own. It hurts the profit margins, see. But we, the world in general, have the technology to build pretty darn clean power plants, establish reliable networks of electricity, fuel reliable and high-mileage vehicles (oh, the more affluent love their SUVs, but even those get half-way decent mileage anymore) and power the manufacturers that could produce goods and services for ALL countries – and for a small percentage of the money wasted, and to be wasted, on the myth of CO2 mitigation. We’d be there by now, and most of the way to universal free healthcare on top of it, if we’d put any effort into it. Not waiting for our area to switch off the gas and coal plants, the nukes, and hope the sun stays out and the wind blows enough to run the furnace for a few hours in the winter, or pump the wastewater to the treatment plant, and so on. So, yes to the coal plant, no to renewables. Why bother with any of this? Elon Musk is going to install batteries and solve are your problems. By the way….how is that going? Must be close to finished by now. The PR people can’t make a decision regarding what colour the batteries should be; and whether they should have a flowery motif, or something a little more “urban”. You wouldn’t believe how difficult it is to chose the right shade of green. Oh, I know. I go quite puce, at the thought! How dumb does our megalomaniac prime minister think Australians are. The U.S.is going to become a powerhouse economic wonder. He knew that after Trumps victory. So he gave billions of dollars stolen from the people of Australia and signed an agreement with unelected greedy freaks. Dumb enough to vote for a megalomaniac as Prime Minister? The logic makes sense, the rules do not. Adding a new power station that produces electricity at a lower cost will not lower the power price to consumers. The RET is the problem. Its forces consumption of high priced energy. Adding any cost above zero only increases the net cost. Its a tax by stealth. Having a carbon target (Finkel) does not change this position. Base load coal generation cannot survive beyond its life cycle date under this regime. Nor can power hungry businesses. The Greens are getting for what they asked. No new businesses, part-time employment, deflation, socialism and taxes without representation. The RET makes even less financial and practical sense than did the NBN which commenced without a cost-benefit analysis. This is all about politics, foreign leftist UN based politics, and convenient crony capitalism cooperating based on relieving taxpayers of money via subsidies and very high price of electricity. What would be best for national prosperity and cost of living is ignored, obviously. Solar hot water panels have fallen victim to this weekend’s cold snap, bursting, splitting and leaving home owners with plumbing bills in the thousands. Another Maunder minimum will kill all hot water solar panels…oh the irony…..
Well I never! Fancy that. Cold kills solar panels as well as humans. Perhaps when the Canberra community of lefties have their PVs killed by their very cold winter temps, the truth of their stupidity might even dawn on them. Hope, unlike spring, is eternal. I note that Canberra managed a -8.7°C a couple of days ago. How many PVs did that knock over I wonder? Cold generally won’t knock over PV, but it isn’t difficult to bust an open loop solar water heater. Installation companies knew Melbourne’s history of cold temperatures. The cost of a closed loop, freeze protected solar water heater is significantly higher than an open loop system. I don’t know how SWH companies marketed their products in Melbourne, but I suspect there wasn’t much consideration given to the more expensive closed loop systems in a competitive marketplace. Why don’t people put heaters in them, to stop them freezing up? Apparently it’s been so cold in Canberra that politicians have been seen walking around with their hands in their own pockets . .
Raven, Thanks for the laugh. Same money will get a 500MW Wind plant, going on recent costings. Total lifetime output from both. Hmm! 12.5 times as much power. The way I read it we the taxpayer and consumer pay the windfarmers 3 billion every year so over the life of the coal plant of about 50 years the equivalent payment is 150 billion. That would build an awful lot of new coal plants. Or am I wrong and the subsidy covers the life of the wind turbines? For us laymen please produce some numbers if nuclear power is introduced! “Overall, 1,600 coal plants are planned or under construction in 62 countries, data from the Global Coal Plant Tracker portal. WHY are they building secure base load HELE plants?? One … MW Solar plant, which will generate .. TWH unreliable power over an operating life of …. years. Tony, I guess you or others here can fill in the blanks. If WE don’t start to make noise and get sheeple to think then WE are more to blame than those who were not told!! Oh, ohh, and don’t forget to mention the $3 billion yearly subsidy to unreliables! I was in Cooperpedy a couple of weeks ago and the town appears to be up in arms over the new renewable electricity prices being touted . Not sure what they were paying but from memory the new price per kWh is similar to what I pay in Victoriastan. Although there was an initial directive that no private solar allowed they have relented and you can own and use any generation method but have to be disconnected from the grid . Damnitall Crakar! Couldn’t you have turned your critical faculties to the real error in 3.2 above? It’s the sort of unnecessary nonsense that gets me either raging or disconnected. Or both! And do photo voltaics bust when they freeze? Serious question… does this advanced coal technology work with Victorian brown coal? Yes HELE works with brown coal albeit at a slightly higher cost. Still far cheaper than renewables. Lets build one right now to replace Hazelewood! Excuse me! It is not acceptable to ask questions, and have discussions, on the basis of colour. I am appalled that the moderators let you get away with it! Emissions drop from roughly 1300 to 800 roughly 38%. Based on the original figure in green claims and the actual figure in the latest lignite (brown coal) plant in Germany. This may be optimistic but the Greens are unlikely o claim that their original figure was exaggerated, can they? It should always be remembered that “controlling greenhouse emissions” is a fool’s argument. Otherwise, you’re buying into the insanity–I repeat, it’s INSANITY. “…emissions drop…” Water? Plant food? Road fill? These Chinese corporations are building or planning to build more than 700 new coal plants at home and around the world, some in countries that today burn little or no coal, according to tallies compiled by Urgewald, a Berlin-based environmental group. Many of the plants are in China, but by capacity, about a fifth of these new coal power stations are in other countries. Experts say research shows a natural cooling cycle that occurs every 230 years due to sun radiation cycles began in 2014 and will send temperatures plummeting by 2019.This is because scientists are expecting a “huge reduction” in solar activity for 33 years between 2020 and 2053 that will cause thermometers to crash here on Earth. So we are on course for a “Little Age Ice” within the next few years thanks to this low solar activity. Cooling from 2019 into about 2020 to 2021 will bring world temperatures back to where they were in the 1940s through the 1960s and then after that minimuns that will cause our rivers to freeze over. Its already happening in Canberra this week with record low temperatures! Gee…….a little bit of man made global warming would be handy, fellers…..bring on the coal fired plants! “Little Age Ice” should be “Little Ice Age” ha……..ooh, I hope power prices are lower when it sets in! Wont happen, if anything, the NWO mob will crank prices up A LOT MORE and make collecting firewood illegal, to make sure as many people die as possible. They know the cold is coming, so what better opportunity to kill off may “useless eaters” as possible…. Gotta love the demented eco-nutter Gaia worshipping marxists dont you? Well UAH temperature series does not show it yet, even though the “cooling” has been going for 4 years. Maybe they are right. Who are these experts? Unfortunately climate timetables are notoriously unreliable, sort of like MS Windows updates — not often liked when it occurs, liked and appreciated on the rare occasions when it comes good, royally vilified when it all goes wrong. If it gets to the point where we have to reboot the sun every morning, then we will seriously be in trouble. Blue sun of death. Oh Dammit, not again…. I always liked Sun95 anyways. The new model sun will be reboot at the start of the new cycle, and will remain shining on the new flatter circular earth but at a reduced rate of a quarter of what is the current peak levels. This is to assist with validating the climate models, and the IPCC would like to thank MS for all their assistance in the matter. The UN appreciates your understanding during these difficult times. So does correlation mean causation in this instance? I am still bemused as to how the public still doesn’t know that hundreds of coal fired power stations are being built all around the world as we speak with hundreds more in the planning stage for one specific reason. They are using coal for the production of affordable base load power to improve their competitiveness – something that renewables can’t deliver and probably never will at least in our lifetimes. Other countries know the world economy is sluggish at best and may be starting to slide into a world wide recession. So the question must be asked and answered, why is Australia committing economic suicide by focusing on renewables and slowly shutting down our coal fired power industry? This will kick the bejeeuz out of the brainwashed. Forget HELE I’ll take a Chinese state of the art plant off the shelf. Then all hell will break loose…. Why do you think they have been makingthe police in paramilitary units for so long? They are prepared for whats coming. The anti-terror laws arent about terror IMHO, they are setting up a police state to crush the coming unrest. Schools with funding for 6′ black fences? Nope – detention centres in centre of evey town and no one has noticed…. But a new HELE plant would be payed for by the investors! They’d build and we pay for power – is that correct? If Wind Mills are built, we pay them to build & pay for the power! The difference between Oz and China, Japan etc is that our populous eastern fringe is right on top of the world’s greatest supply of black coal, secure, accessible and abundant for centuries to come. And those notorious energy paupers and own-foot-shooters, the South Australians, have the uranium and geological stability to make their region a nuclear showpiece to the world. The West has gas like Qatar has gas, even if at a higher price point – just fix/add infrastructure. To turn up one’s nose at such gifts is irrational, fetishistic and wasteful, that’s true. But worse than that, it’s impertinent. And worse than that, it’s impious. SA has at least 10 BILLION tons of black coal, The east of the State has brown coal deposits. The black coal may be less pure (higher mineral content as in Leigh Creek) but is available if wanted. Deposits around the railway line to Alice Springs. That is not counting the Cooper Basin which is considered to be bigger in coal reserves even though it is supplying gas. I’ve got no skin in the game because I’m on the other side of the Tasman. My advice, FWIW, is forget the LE, and build HE big, up and down the east coast. SA should keep a close watch on MSR Nuclear Research and Development. They’ve got the fuel, so they should go for it. Tasmania can hold SA’s hand during the watch. Sorry, but after watching this debacle, I’m reminded of Robert Muldoon’s notorious and totally disrespectful utterance from the 1970s. Out of respect, I won’t repeat it here. Some area towns are doing all they can to prevent large wind farms from blowing into their borders. Clarence and Tonawanda are crafting laws to prohibit all large-scale industrial-sized wind farms that generate power to sell back to the grid. The Tonawanda Planning Board is expected to talk about proposed laws to ban large wind farms at its meeting Wednesday night, July 5. The town “doesn’t want to end up like Somerset or Lackawanna,” Planning Board Chairman Kenneth Swanekamp said. Cuomo also noted that these projects will be developed out of view from the coast and in collaboration with local communities and stakeholders. Engert said the governor has placated those with million dollar views on the Hamptons, but in Somerset they are fighting to get towers 2,000 feet from a property line. Families may have to pay higher energy bills unless the government subsidises a gas storage facility recently mothballed by Centrica. The warning — from Italian energy distribution giant Snam — follows the recent closure of the Rough plant off the Yorkshire coast. Snam’s chief executive Marco Alvera said the decision would leave Britain more exposed to spikes in wholesale prices. “Flows from storage [plants] allow countries to smooth over short-term price volatility,” he said. “Without it . . . the UK may need to pay higher prices to attract gas from Europe or buy LNG cargoes”. Centrica has announced closing of the gas storage facility of 3.31 billion m3 in Rough, which accounts for around 70% of the United Kingdom’s entire gas storage capacity. Rough, located offshore the English east coast, entered into operation in 1985 after the reconversion of a mature deposit and in the past it covered up to 10% of the winter peak demand for gas of the United Kingdom, which depends importation from Norway and continental Europe for gas and LNG (mainly on Qatar) accounting for more than half of the country’s consumption. Perhaps someone, with the backing of several institutions, could do the research required to genetically modify palm trees, so that, rather than leaves, they would grow, not only blades, but generators as well, inspired by wind turbines which produce wind power when the wind blows, They would be more cost-effective because, grown from seed, wind plant construction costs would be reduced to virtually zero.
! I like it….no crazier than some of what the warmistas come up with. I take it that importing Wind Turbine Palm tree seed would be acceptable to AQIS? These are all interesting ideas. However they seem pointless to me. They only make sense in the context of CAGW. If Global warming is non existent, or if it is in no way catastophic, or if it is not caused by CO2, then ground based coal or gas power stations are superior in cost, efficiency and more environmentally friendly. Same with Nuclear pwer stations. Is an absolute myth. Perpetuating this nonsense deserves harsh treatment. There is no basis for comparing dispatchable generation with intermittent generation. A modern economy simply cannot run only when the wind blows and sun shines. The only sane way to compare prices is to bring the intermittents into line and require dispatachable output. That means that with 98.5% certainty they can deliver their rated output on the second Wednesday in February every year. To achieve that with currently available technology the price to recover costs over a 20 year life, even at the best possible cost of finance, is $700/MWh. It is just dumb to make comparisons like this. It gives hope that with slight improvements in technology the intermittents can compete. They are a country mile from being competitive. There needs to be massive improvements in the technology to be economically competitive. Unless the policy trajectory changes, the cost of electricity in Australia will reach $700/MWh. This is the cost of electricity produced from 100% intermittents with dispatchable capability. US President Donald Trump’s decision to withdraw from global action against climate change could put the Earth on a ‘hothouse’ course similar to the one that befell Venus, British physicist Stephen Hawking has told the BBC. ‘We are close to the tipping point where global warming becomes irreversible,’ Hawking told the broadcaster in an interview as part of a year-long celebration of his 75th birthday in January. The interview was being released in sections by the BBC on Monday. In the four months since he took office as the Environmental Protection Agency’s administrator, Scott Pruitt has moved to undo, delay or otherwise block more than 30 environmental rules, a regulatory rollback larger in scope than any other over so short a time in the agency’s 47-year history, according to experts in environmental law. An earlier version of this article referred incorrectly to a meeting between the Environmental Protection Agency administrator, Scott Pruitt, and Andrew Liveris, the chief executive of the Dow Chemical Company. While the meeting was originally scheduled for March 9 at an energy conference in Houston, spokespeople for both the E.P.A. and Dow said it was later canceled and did not take place. I thought Hawking was supposed to be a scientist? He’s turned into a BBC one, for what that’s worth. He’s a mathematician – a very good one. But he is deluded on this matter. Thanks Pat for all your good work. I have always had the greatest respect for Stephen Hawking but I cannot agree with his views of the impending climate change world disaster scenario. For someone of his intellect to be unable to get the climate debate and associated facts into a proper perspective is disappointing at the least. Unfortunately a lot of people may be persuaded to his point of view because of who he is. Not so for me. I will rely on my own reasoning and intellect. Even great minds can be wrong. We need to remember that Hawking cannot speak, and must communicate via a keypad that feeds into a speech simulator. What he types on the keypad can also be printed as a record. But we have no way of knowing if he actually said what he is purported to have said, since other people could have had access to various points in that system, and put those words, “into his mouth”, as it were. For his words to be taken seriously, the BBC would need to demonstrate a secure chain of custody for the information, and get Hawking’s personal endorsement, in public. I agree Rereke, one does have to wonder at the authenticity and integrity of this BBC report. I’d like to see that as well, but the fact is, he’s a specialist, a theoretical physics specialist, probably in just a few key “bleeding-edge” areas of that specialty, and while he’s amazing at what he does, it doesn’t mean he knows all. He isn’t trained in what runs a climate, he’s trained in maths so complex they don’t have real numbers, in areas so arcane there are no ways to prove or disprove them as yet. He could say yes, the maths are right – but he can’t say if what is held as constant is correct (lots of guesses in CliSci) or should even be held as a constant. He can’t tell us what the biome of the atmosphere does in moderating effects – no one can right now. It’s even possible he has not a clue beyond what is shown him, told to him, and is basing his belief in being on the edge of disaster on that. He’s walled in, a computer is what stands between him and no interaction at all, and people around him quite probably have a huge influence on what he sees of the “outside” world. He should have been able to look at the predictions, the lack of climate change as predicted, the lack of adequate temperature data to estimate a global temp, the lack of knowledge of how it all works, the guesswork and arbitrary assignments of value and constants, and say “There isn’t enough information to make an informed guess, much less choice, much less base policy” except – it’s possible he just would not consider fra-d or even simple over-reaction to misinterpreted and “adjusted” data on such a scale (hysteria inducing scales) possible. AP & Reuters desperate for a daily CAGW update come up with two brief, nonsensical pieces. nothing else to read at the links. LISBON, Portugal — U.N. Secretary-General Antonio Guterres says the United States may meet the Paris climate agreement’s targets despite pulling out of the deal. Guterres said in a speech Monday in Lisbon, Portugal that President Donald Trump’s decision to withdraw from the global Paris agreement strengthened the deal by prompting other major countries to reaffirm their commitment to its ambitions. He named China, India and the members of the European Union as examples. 3 Jul: Daily Mail: World hunger on the rise again due to conflict and climate – U.N. The number of hungry people in the world is rising again after years of decline, as millions suffer from the combined effects of conflict and climate change, the head of the U.N. food agency said on Monday. “Preliminary data available for this year indicates that the number of undernourished people in the world has (started to) rise again,” said Jose Graziano da Silva, director-general of the U.N. Food and Agriculture Organization (FAO). The lack of food, the hunger, is due to conflict and the haves hoarding what they can so the have-nots get even less than the nothing they were getting. This is as true in a refugee camp (the strong stay strong by being greedy, not by following Hollywood movie scripts and turning a rag-tag band of wasted and weak people into a fighting force and making it nice, in the end, for everyone) as it is a of a nation. Most famine and food-shortages in the last hundred years or so – or more – were because of conflict and strong-arm hoarding, greed, lack of supply line (and protection for the supply-line) and etc. I haven’t seen any data on long- or short- term low-crop-yields in areas not affected by conflict. I have seen areas where crops aren’t planted, or are destroyed, because of conflict. Where food that is sent never gets to where it is going, due to conflict. Plus greed and the usual lack of attention to details beyond collecting and delivering it to port. The change in the water’s behavior has been good for Moore and white-water sports enthusiasts – professional kayakers are flocking to the Kern. But it’s also proven dangerous. At least six people have died on the Kern River already this year. Some were playing on the water; others were just trying to cool off. Emergency workers worry there will be more. “This is not the same river [people] may have visited last year,” says Sgt. Zack Bittle, with Kern County Search and Rescue. The water is 10-times stronger than it was a year ago, Bittle says. Riverbanks are less stable. Vegetation and brush that had grown on low shorelines during the drought are now submerged, creating invisible, underwater hazards. Up and down the Sierra Nevada Mountains, waterways are flooding with snowmelt. Further up California’s Central Valley, homeowners were evacuated when the King River breached the riverbank. Reservoirs are near full. Coal burns pretty well, but leaves a fair amount of stuff in the air. We have a basic plant in our neighborhood, commissioned about 1980. But its not old and cold. First scrubber about 1990, second level scrubber about 2004, removed about 95 % of particulates. Conversion to fluidized bed improved efficiency. Electostatic circa 2014 gets about 80% of the rest. Waste heat feeds a Desal plant adjacent. Waste gymsum ash goes to a drywall plant, along with gypsum from local phosphate rendering plants. Discharge heat creates a winter habitat for endangered West Indian Manatee. Also warms island at outlet mouth that is deeded to Audubon as nesting for 10,000 seabirds. the supply allows for great efficiency. data in the 10-K, but it’s almost breakeven. There are much worse sops to environmentalists. We have electric rates in the lowest 25% of the US. due to alternative energy does not penetrate the consciousness…in fact, nothing in the real world seems to penetrate. The solution is ‘smart metering’, that only provides power to their households that meets their environmental specification, for which they pay the full, un-subsidized cost. To correct the stupidity which is the result of the GHE, you must get rid of the prediction (that the average earth air temperature would be about 33 degrees Celsius less if not for atmospheric greenhouse gases). So consider the following essay if it prints. Natural Science: Can You See? We will consider a few excerpts of how Agassiz taught his students from narratives, which Cooper included in his book, of two of these students. But first we need to consider a quote which, as translated by someone, has been attributed to Galileo. We cannot teach people anything; we can only help them discover it within themselves. Professor Shaler (From The Autobiography of Nathaniel Southgate Shaler) wrote: I had assigned to me a small pine table with a rusty tin pan upon it. … When I sat me down before my tin pan, Agassiz brought me a small fish, placing it before me with the rather stern requirement that I should study it, but should on no account talk to any one concerning it, nor read anything relating to fishes, until I had his permission so to do. To my inquiry, ‘What shall I do?’ he said in effect: ‘Find out what you can without damaging the specimen; when I think that you have done the work I will question you.’ In the course of an hour I thought I had compassed that fish; it was rather an unsavory object, giving forth the stench of old alcohol, then loathsome to me, though in time I came to like it. Many of the scales were loosened so that they fell off. It appeared to me to be a case for a summary report, which I was anxious to make and get on to the next stage of the business. But Agassiz, though always within call, concerned himself no further with me that day, nor the next, nor for a week. At first, this neglect was distressing; but I saw that it was a game, for he was, as I discerned rather than saw, covertly watching me. So I set my wits to work upon the thing, and in the course of a hundred hours or so thought I had done much—a hundred times as much as seemed possible at the start. I got interested in finding out how the scales went in series, their shape, the form and placement of the teeth, etc. Finally, I felt full of the subject, and probably expressed it in my bearing; as for words about it then, these were none from my master except his cheery ‘Good morning.’ At length, on the seventh day, came the question, ‘Well?’ and disgorge of learning to him as he sat on the edge of my table puffing his cigar. At the end of the hour’s telling, he swung off and away, saying: ‘That is not right.’ Here I began to think that, after all, perhaps the rules for scanning Latin verse were not the worst infliction in the world. Moreover, it was clear that he was playing a game with me to find if I were capable of doing hard, continuous work without the support of a teacher, and this stimulated me to labor. I went at the task anew, discarded by first notes, and in another week of ten hours a day labor I had results which astonished myself and satisfied him. Still there was no trace of praise in words or manner. He signified that it would do by placing before me about a half a peck of bones, telling me to see what I could make of them, with no further directions to guide me. In ten minutes I had seen all that could be seen in that fish, and started in search of the Professor—who had, however, left the Museum; and when I returned, after lingering over some of the odd animals stored in the upper apartment, my specimen was dry all over. I dashed the fluid over the fish as if to resuscitate the beast from a fainting-fit, and looked with anxiety for a return of the normal sloppy appearance. This little excitement over, nothing was to be done but to return to a steadfast gaze at my mute companion. Half an hour passed—an hour—another hour; the fish began to look loathsome. I turned it over and around; looked it in the face—ghastly; from behind, beneath, above, sideways, at a three-quarters view—just as ghastly. I was in despair; at an early hour I concluded that lunch was necessary; so, with infinite relief, the fish was carefully replaced in the jar, and for an hour I was free. On my return, I learned that Professor Agassiz had been at the Museum, but had gone, and would not return for several hours. My fellow-students were too busy to be disturbed by continued conversation. Slowly I drew forth that hideous fish: it seemed a most limited field. I pushed my finger down its throat to feel how sharp the teeth were. I began to count the scales in the different rows, until I was convinced that that was nonsense. At last a happy thought struck me—I would draw the fish; and now with surprise I began to discover new features in the creature. Just then the Professor returned. ‘That is right’ said he; ‘a pencil is one of the best of eyes. I am glad to notice, too, that you keep your specimen wet, and your bottle corked.’ With these encouraging words, he added: ‘Well, what is it like?’ He listened attentively to my brief rehearsal of the structure of parts whose names were still unknown to me: the fringed gill-arches and movable operculum; the pores of the head, fleshy lips and lidless eyes; the lateral line, the spinous fins and forked tail; the compressed and arched body. When I had finished, he waited as if expecting more, and then, with an air of disappointment: ‘You have not looked very carefully; why,’ he continued more earnestly, ’you haven’t even seen one of the most conspicuous features of the animal, which is as plainly before your eyes as the fish itself; look again, look again!’ and he left me to my misery. I was piqued; I was mortified. Still more of that wretched fish! But now I set myself to my task with a will, and discovered one new thing after another, until I saw how just the Professor’s criticism had been. The afternoon passed quickly; and when, toward its close, the Professor inquired: ‘Do you see it yet?’ ‘No,’ I replied, ‘I am certain I do not, but I see how little I saw before.’ ‘That is next best,’ said he, earnestly, ‘but I won’t hear you now; put away your fish and go home; perhaps you will be ready with a better answer in the morning. I will examine you before you look at the fish.’ This was disconcerting. Not only must I think of my fish all night, studying, without the object before me, what this unknown but most visible feature might be; but also, without reviewing my new discoveries, I must give an exact account of them the next day. I had a bad memory; so I walked home by Charles River in a distracted state, with my two complexities. R. C. Sutcliffe was a meteorologist, hence a naturalist, who wrote a book (Weather & Climate, 1966) for W. W. Norton & Company Inc. as part of their Advancement of Science Series. In its first paragraph he lamented: Throughout the history of modern science dating from that time [Newton’s The Principia] it was significant that ‘natural philosophy’ was almost a synonym for physical science. The dual interest of the scientist in the natural world of phenomena and in the basic principles which explain them, which identify the natural with the rational, was accepted generally and did not begin to lose its validity until—with the tremendous success of experimental laboratory physics of the late nineteenth century—the applications of basic physical theory were largely diverted from the natural macro-environment of man to the essentially simpler physical systems which he invented for himself and learned to construct and control. On the second page Sutcliffe continued his lament: ‘Natural science’, as the term is most naturally understood, has suffered astonishing neglect. That the neglect is extreme is illustrated by the very curious fact that a student entering the science stream will go through school and university studying physics and mathematics and have no more idea than an arts student of the significance of an earthquake, an ocean current, or a monsoon wind, to take illustrations from three of the environmental sciences. Actually we must go to schools of geology and geography to find students who have been asked to direct their minds to the natural phenomena on earth, … To decry schools of geography has been a commonplace reaction of the physicist, presumably because they did inadequately many things which the physicist had on his conscience and should have been doing himself. In the fifth chapter—The Microphysics of Clouds—Sutcliffe wrote: If air is carefully purified by filtering, it will not produce cloud droplets even if cooled by expansion far beyond its normal saturation point or dew point. … These results, obtained first by Wilson and broadly confirmed by many later experimenters, have a very important bearing on natural meteorology, not because supersaturation occurs in the atmosphere but because it does not occur: why is it that in the atmosphere condensation to clouds invariably happens as soon as normal saturation is reached? Sutcliffe did not recognize that the observed fact that supersaturation of water vapor in the natural atmosphere had never been observed constituted a law of the natural atmosphere and it seems no one but I have (Of course, I really do not know what another has considered; I only know what I have not read). But given the reproducible results (facts) of two of these two different situations, Sutcliffe answered his question. The answer is that the natural atmosphere, however clean it may appear to be, is always supplied with a sufficient number of minute particles of salts, acids, or other substances which serve just as well as liquid water in capturing water molecules from the vapour. These are the ‘nuclei of condensation’, and are effective as soon as the air becomes even slightly supersaturated. Let us review a portion of Agassiz’ lament from the first paragraph of his Introduction: The dual interest of the scientist in the natural world of phenomena and in the basic principles which explain them, which identify the natural with the rational, … . I reword Sutcliffe’s scientific law slightly because the dewpoint temperature (temperature at which atmospheric water vapor begins to condense as the atmosphere cools) is a measured physical property of the natural atmosphere. The law simply is: The temperature of the atmosphere can never be less than its dewpoint temperature. So the atmosphere’s rate of cooling, regardless of the cause of its cooling, immediately decreases because of the ‘release’ of water vapor’s very significant latent heat as the vapor condenses. Since water vapor’s latent heat of condensation is not known to be related to its ability to absorb certain wavelengths of near and far infrared radiation, it seemed the measured values of the dewpoint temperatures of the atmosphere in contact with earth’s surfaces limited the minimum temperatures of this surface. And based upon such minimum temperatures, it seemed that a prediction, which was that the earth’s average temperature would be about 33oC lower than that presently observed if not for the ‘greenhouse effect’ (GHE) of certain atmospheric gases was refuted by this law of the natural atmosphere. However, a proponent of the GHE was quick to argue that the values of the dew point temperatures were that observed because the earth’s surface temperatures were as great as they were. And I had no observations at the time to refute this argument. This brings us to the question: Can You See? About six months ago I first learned about an observation project—SCAN (Soil Climate Analysis Network)—that has been funded through the US Department of Agriculture since the early 1990s. The network now has more than 200 sites in the USA at which most fundamental meteorological variables, except those measured during atmospheric soundings, are measured continuously but recorded each hour. However, the uniqueness of the project is that soil temperatures and soil moistures at depths of 2, 4, 8, 20, and 40 inches are measured and recorded each hour as well as the downwelling solar radiation. Of course, measurement of air temperatures is part of the meteorological measurements. An excuse I give for not having discovered this gold mine of high quality, fundamental, data much earlier is that I have yet to discover a published article which uses this data for climatic purposes. What is the relationship between soil temperatures and air temperatures? What is the relationship between soil temperatures and soil moistures? What is the relationship between downwelling solar radiation and air temperatures, or soil temperatures? Look and see. One thing you can see is that downwelling solar radiation during June at a latitude of about 30oN is capable of heating a dry soil at a depth of two inches to a maximum temperature greater than 55oC. Which observed fact simply refutes the argument that the earth’s present temperatures are primarily due to something other than solar radiation. Look and see. There is another gold mine of more radiation data which has been measured in addition to downwelling solar radiation. These additional radiations are direct-normal solar, diffuse solar, upwelling soar, upwelling infrared, and downwelling infrared. All radiations are continuously measured and are presently recorded each minute at seven USA sites. This project is named SURFRAD (surface radiation) and is funded through the US Department of Commerce via the NOAA agency. It was begun in the mid 1990’s. Look and see. I composed on Word, copied, and pasted here. When I pasted I cannot remember if that was when the change occurred or if occurred when i submitted. So this is a test doing directly what you suggested, if I understood you: . Tried various possibilities but nothing worked. But thanks for trying to help me. We shouldn’t use the term HELE. The LE stands for low emissions and this implies that CO2 emissions are a problem when clearly they are not. Obviously harmful emissions are scrubbed from the exhaust like in all modern coal plant. CO2 is never mentioned. It is always implied as ‘emissions’ or ‘pollution’. I suppose the entire living world could stop breathing and the world would be better off? When will there be an admission that CO2 levels are set by the ocean temperature and the 98% of all CO2 dissolved in 4km of ocean? We could not change CO2 levels if we wanted to do so and 350,000 windmills have had no discernible impact on CO2 levels. So the entire windmill project is an abject failure. So the windmill industry is now pushing that windmills are far cheaper because they have no fuel cost. (Graham Lloyd, the Australian yesterday). They are no longer saying windmills will actually reduce CO2 levels because as Blind Freddy can see, they don’t. Plus as I wrote yesterday, coal and gas are also free. If there is a Royalty to our government, that is still not a cost. We (the government) get the cash. Unfortunately in the new world, the government is not us, but a lot of people who think it is their money to spend on themselves, so perhaps there is a cost to oil, gas and coal but for all the wrong reasons. Wind and solar are not free. The infrastructure required to ‘harvest’ them costs an absolute fortune. I like to point out that our collected rainwater is not ‘free’ either…far from it with the tanks, piping, pumps required to use it and the maintenance costs involved. Neither is wood as it takes a lot of time and energy to produce it in the right size and seasoned condition to use it. Neither is our hot water ‘free’ as we paid a considerable sum for the evacuated tube hot water system on the roof and the stove with hot water jacket. Jo shouldn’t the heading read $3 billion “per year” subsidies. $11 billion over the next 4 years. Or maybe I’ve got this wrong. OH! Oh! Think I misread. I was thinking of the proposed $11 billion over the next 4 years. BUSINESSES will be forced to cut staff or shut down altogether as crippling energy price hikes begin sweeping across the nation this month. “This is the biggest business crisis I’ve seen in my lifetime,” said Peter Strong, chief executive of the Council of Small Business Australia. “The GFC was managed and it affected everybody, but this is only Australia and we cannot see a solution. It seems not one pollie is prepared to speak up and say scrap the RET. There will be no coal station built while we have the RET and state legislation that mandates wind/solar/hydro must increase their share of electricity supplies from the current 14% to at least 23.5% by 2020. Hydro provides about 6% and will not increase, so wind/solar must increase their share from 8% to 17.5% in just three years. Hence the mad rush by windmill owners to collect the cash that comes from wholesale prices currently over 10 cents/KWhr plus their sale of “clean energy certificates” that provide a further 8 cents. But when the wind doesn’t blow and the sun doesn’t shine, there must be backup supplies available. With a shortage of gas, we are now seeing the ridiculous situation of diesel generators being installed. Affordable and reliable electricity Mr Prime Minister and Premiers Weatherill and Andrews? Not until we have leaders prepared to make Australia competitive again. So to provide wind with gas back up, total cost $175-$215/MWhr. But to comply with the politically correct instructions, Dr Finkel added that by 2050 wind/solar with backup will be cheaper than coal. By then, Australia will be out of business. “Lack of wind blows out power costs”. The reason.. “The trend..more prevalent as the globe warms”. So Global Warming is hurting wind farms. Even a “wind drought”. Almost laughable. The next excuse “after this year’s closure of the Hazelwood brown coal-fired power station”. So closing the (brown coal) power station, removing the cheapest form of energy has pushed up power prizes. No suprise there. Does anyone stop to ask why closing the biggest and by far the cheapest energy provider pushed up prices dramatically? Of course not but why doesn’t the weakest, most expensive and the one suffering a real shortage of supply (wind drought) close instead? The implied answer, the coal was brown and unacceptable. It had to close for our children and our children’s children.. So Global Warming is causing a wind drought and hurting wind farm profits while Hazelwood is still reponsible for soaring prices? What else would you expect from brown coal? This leg pulling has to stop. It is high farce. Scientists say the creatures are pyrosomes, which are tropical, filter-feeding spineless creatures usually found along the equator. They appear to be one long pink tube, but in reality, they’re thousands of multi-celled creatures mushed together, generally about 6 inches (15 centimeters) long. Migration of species was unknown before Global Warming. My ancestors arrived here in Australia 150-200 years ago. It was too cold at home. Not enough land or food. We collectively brought foxes and rabbits and goats and cats and more people. Some brought camels and Afghans to drive them. There are now a million wild camels in outback Australia. Never heard of migration of species. Now it the ecopalypse and we need to pay a great deal for electricity, thanks entirely to our government. They blame ‘market forces’ but no one believes them. Musing on Lloyd’s argument, Alan Kohler’s pronoucement. Wind is cheaper because the fuel costs nothing. Is this the start of the segue from Global Warming as being the justification for the $1.5Tn a year on windmills and solar? Clearly the $1.5Tn has had no impact on CO2 or the temperature, which has barely moved for twenty years. The argument is that subsidies are an ‘embarrassement’ (Alan Kohler) and unnecessary. Wind is the new ‘baseload’. However you would have to think that $1,500 Bn @ $2Bn a HELE station would build 750 HELE new coal power stations a year, every year. The huge Green industrial complex is now fighting for income in a world which with good reason no longer believes CO2 has anything to do with temperature. They are even angry at Hazelwood’s closure because evil brown coal has forced up the price of electricity. More irony than a trestle bridge. Repeat the mantra often enough and people believe it. Wind and sun are free, therefore windmills and solar panels must provide cheaper electricity. Therefore to provide wind with back up: $82+$83 = $165/MWhr (without subsidy) or $247/MWhr with subsidy. Wind cheaper than coal? Dream on. Meanwhile we pay higher prices for electricity. But consumers in both States then have to pay the $82/MWhr for 15% of supplies through clean energy certificates. Robber could I ask you (and anyone else) to elaborate on the “15% of supplies” statement. A couple of months ago you alluded to the REC payments being linked to renewable power as a proportion of total power delivered, and that low proportion being the current limiting factor on the effect of the RET on coal power RECs. That’s my interpretation of what you said. There have been conflicting statements from other commenters about that point. The opinion most often presented is that every MWh of coal power is slapped with an REC charge independent of whatever power is or is not produced by wind and solar. Can you clarify that point please? Also are RET payments to a renewable generator linked to its power actually delivered to the grid or to power generated regardless of whether that renewable power makes it to the grid or not? That point has also been in contention by some commenters. Beowolf, like all things to do with government, it’s complicated. The Renewable Energy Target works by allowing both large-scale power stations and the owners of small-scale systems to create large-scale generation certificates and small-scale technology certificates for every megawatt hour of powe​r they generate. Certificates are then purchased by electricity retailers (who supply electricity to householders and businesses) and submitted to the Clean Energy Regulator to meet the retailers’ legal obligations under the Renewable Energy Target. The Large-scale Renewable Energy Target creates a financial incentive for the establishment and growth of renewable energy power stations, such as wind and solar farms, or hydro-elect​ric power stations. It does this through the creation of large-scale generation certificates. Large-scale generation certificates are created based on the amount of eligible renewable electricity produced by the power stations, and can be sold or traded to Renewable Energy Target liable entities, in addition to their sale of electricity to the grid. Liable entities have a legal obligation to buy and surrender large-scale generation certificates to the Clean Energ​y Re​gulator on an annual basis. The 2017 renewable power percentage is 14.22%. (I rounded it up to 15% of supplies). The number of large-scale generation certificates required to be submitted by electricity retailers is set each year by the renewable power percentage​. The surrendered certificates enable the annual targets to be met, and contribute to reaching the 2020 target of 33,000 gigawatt hours of renewable electricity, as set under section 40 of the Renewable Energy (Electricity) Act 2000. The annual target in 2017 is 26,031 gigawatt hours or 23.031 million certificates. So coal power is not slapped with any REC charge, but AEMO gives priority to available wind/solar generation, and coal/gas are used to meet the balance of demand. Note that 100 per cent exemption is provided to companies conducting emission-intensive trade-exposed activities (aluminium smelting and similar). However, there is also a roof top solar provision. The 2017 small-scale technology percentage is 7.01%. I am uncertain whether this is additional to the 23.5% large scale generation target for 2020, but it appears as though it is. AEMO does not report small-scale generation into the grid as the price is set – recently it increased from 5 cents to 11 cents to reflect the recent jump in wholesale prices. As I said, it’s complicated, and no doubt keeps an army of bureaucrats busy but adding no value. In California, the Sierra Nevada bighorn sheep, which is listed as an endangered species, lost an estimated 40 to 60 animals. Biologists say the wildlife herds eventually should recover with the help of reduced hunting and a return to at least normal weather conditions next winter. However, forecasters say it’s too early to predict how next winter will play out. And analysts believe Ofgem will be “pragmatic and measured” in a huge victory for the likes of British Gas-owner Centrica. Deepa Venkateswaran, analyst at City stockbroker Bernstein said: “The Government has passed the buck to Ofgem. Senior Tories demanded Theresa May water down her attack on energy companies in the aftermath of the Election. The UK looks set to miss a key renewable energy target, campaigners have warned, in the latest sign that the Government is backsliding on the fight against global warming. As Angela Merkel prepares to lead attempts to take climate science denier Donald Trump to task at the forthcoming G20 summit in Germany, Whitehall officials quietly published a report revealing that Britain is falling behind. The report, which is the latest update on progress (LINK), said the UK had reached 8.9 per cent in 2016 and admitted hitting the 2020 target would be challenging. Leonie Greene of industry body Solar Trade Association said the figures underlined “how big a challenge it will be to meet the UK 2020 renewables target, which is modest by European standards”. He has longstanding expertise in climate modelling and climate impact science, multi-year experience in providing scientific advice at the climate-policy interface including targeted scientific support to SIDS and LDCs in the UNFCCC process. Carl is member of the steering committee of the initiative Half a degree Additional warming, Prognosis and Projected Impacts (HAPPI) and coordinates the ***BMBF consortium project HAPPI-DE. at what point will people realise the never-ending attacks on President Trump all boil down to his disrupting the CAGW power/money grab? why doesn’t Stiglitz write the following about China and the 700 coal-fired power plants it is building around the world, etc etc? No. Only by the media, 95% of whom donated to the Clinton Campaign. Plus their friends overseas who hate America and Christianity and democracy anyway. Lord Stern. The great economist who knows all about ‘the science’. Sarc/ (Did I need that?). The electricity industry has become a de facto wealth redistribution racket. Those consumers who can still pay their ever increasing bill have, unfortunately, become a support base for that significant, and growing, other grouping of electricity consumers: welfare recipients, bill defaulters, extended time payers, solar electricity rebate recipients and, of course, the greedy power companies. It’s all the middle men. When you cannot sell electricity for 4c kwhr but the public are paying 40c kwhr, so the middle men are getting 90% of what we are paying. Hazelwood has forced the price up by closing? Does that even make sense? The policians world is a Bizarro one where everything is the reverse of the truth. Agree completely, but no need for the phrase de facto. The RET is a potentially illegal Act forcing us to pay third parties for nothing at all. It is not even a tax, which at least would go to our government. I seriously doubt that the government has the right under the constitution and legal traditions to force the enrichment of third parties for nothing at all. •Iran signs deal with France’s Total and China’s CNPC to develop its South Par gas field. •A consortium of Indian businesses have made a bid for another of Iran’s gas fields. Total has taken a 50.1 percent interest in the South Pars project, and alongside state-owned China National Petroleum Corporation, which holds 30 percent, and Iran’s Petropars (19.9 percent), will begin producing gas for the Iranian market from 2021. Already, India, one of Iran’s most steadfast trading partners, on Monday announced that a consortium of domestic businesses would offer up to $11 billion to develop another of Iran’s natural gas fields, Farzad-B field, and create the infrastructure to export the fuel, Bloomberg reported, citing Narendra Kumar Verma, managing director of the overseas investment unit of India’s largest explorer, Oil & Natural Gas Corp. Please! Share your up thumbs between the two (for the cost of one click?) identical posts. Prof Stephen Hawking flies off the deep end, just unbelievable nonsense. Can’t these people read and comprehend? And UAH V 6 drops back to just +0.21 c for June. As we reported last month, the draft from Standards Australia will effectively ban lithium-ion battery storage inside homes and garages after declaring it to be a category 1 fire risk. It will mean any installations will need to be built in a concrete bunker, making it impossible for many homes and costly for others. The proposals have been described as a massive case of over-reach, even by groups whose members form part of the standards advisory committee. Some have suggested that the standards process – which normally takes several years – has been rushed. The main issue is that all lithium batteries are classed as Fire Hazard Class 1 and the principal clause that is causing the problem is 4.5.3. Could this ruling also apply to Tesla cars in a home garage? Not a problem, it was recently reported here that 98% of electric cars are still on the road, 2% made it home. It should. It should also apply to any motor vehicle that has a battery – not many with magneto ignition, crank handle and kerosene lamps these days. As risks are similar. I expect there will be some sense prevail here. There is no doubt that lithium batteries present a serious fire risk as they have incredibly high specific power but I expect many people store their lawn mower fuel in their garage and that would have similar stored energy although it is not quite as available as the energy in a battery unless there is an exposed flame. I have seen a 3mm thick aluminium connector vaporised when accidentally shorted across just a small lithium cell. Working with any metal tools over the cells is a serious hazard. Am I correct it that the lithium ion batteries are a fire risk when they are charging especially fast charging not when they are “at rest” i.e. The car is stopped and turned off. If that is the case then most battery packs such as the Tesla would be most likely to have problems during the day. Does anyone have any info, are they prone to spontaneous ignition? LiPoly batteries have enough available lithium to catch fire when put in water. Or at least earlier ones did. It is not something I have tried but Youtube has examples. Early LiFePO4. large format cells were prone to the case exploding when overcharged – just no pressure relief I think. I believe this issue has been resolved. Tesla batteries are made up of hundreds, thousands and even millions (in case of grid scale) of tiny cans so-called 2170 meaning 21mm diameter and 70mm long. They are not large format cells. Cans are more robust than plastic cases, plastic bags or aluminium boxes that many lithium cells come in. The energy stored in each Tesla cell is only 21Wh so a failure of one cell is not a serious issue in terms of energy release. There could be possibility of cascading failure but I doubt it. I believe the greater fire risk is posed by faults or accidental short circuits. The top line lithium poly batteries have a rated output of 75C. That means current 75 times the rated Ah capacity or, in other terms, reliably discharge its full capacity in under 1 minute. So a 5Ah 6 cell LiPoly battery that weighs less than 1kg can deliver 375A at about 20V – 7.5kW for 1 minute. On short circuit a battery like this fries before you can blink. When soldering plugs you really need to be thinking. LiFePO4 batteries can usually take discharge rates up to 2C and charge at 0.5C. However you can increase cycle life by not pulling as hard and not cycling the full capacity. The relationship between cycle life and DoD is not linear. For a given application where cycle life and cycled energy will dictate the economics there is an optimum DoD. The Samsung phone fires demonstrates the consequence of enabling a short circuit on a lithium cell. I have not seen a Tesla can however other small cans I have come with their own control circuitry that limit discharge rate and prevent overcharge or over discharge. They look like a cell but they have a 2mm thick circuit board that fits on the bottom of the can. It has a whole lot of integrated power and control circuitry to protect the cell and limit its energy release. It is not hard to destroy the circuitry but it can be removed easily and you are left with a perfectly good, but unprotected, cell. A public debate is needed over how much consumers and taxpayers are willing to spend to avoid blackouts, an ex-Tory MP has argued. There must be greater transparency over the cost of ensuring security of supply as the power system undergoes transformation, Laura Sandys told delegates at the Utility Week Energy Summit in London. ***Panel chair and BBC environment analyst Roger Harrabin said he, as a domestic consumer, probably wouldn’t be too fussed by the occasional brief blackout. “My laptop would still be operating because it’s got its own battery. The fridge wouldn’t defrost. The freezer wouldn’t defrost. The oven would keep on cooking because it’s well insulated. I wouldn’t have any lights but maybe I’d have some battery lights or some candles. “It wouldn’t be the end of the world, but we treat it like it would be,” he added. (PUBLIC) MONEY IS NOT A PROBLEM FOR HARRABIN. REST ASSURED UK MSM WON’T BE REPORTING HARRABIN’S COMMENTS IN THE PREVIOUS COMMENT. HERE YOU HAVE EX-BBC RICHARD BLACK REJECTING ANYTHING BUT SO-CALLED “RENEWABLES” WHILE HARRABIN GOES ON THE ATTACK AGAINST NUCLEAR. (DISCLOSURE FROM PAT: I AM NO FAN OF NUCLEAR, BUT THOSE WHO CLAIM WE MUST SHUT DOWN COAL & GET RID OF OTHER FOSSIL FUELS, BECAUSE WE MUST CUT CO2 EMISSIONS, ARE HYPOCRITICAL WHEN THEY REFUSE TO CONSIDER NUCLEAR, AS FAR AS I’M CONCERNED. EDF Energy’s outgoing chief executive Vincent de Rivaz has promised the firm will “earn” the right to operate a new generation of nuclear plant in the UK. To do this, de Rivaz acknowledged, “we must offer the best value for money for taxpayers and we will make it happen”. ***Responding to the NAO report, (EX-BBC) Richard Black, director, of the Energy and Climate Intelligence Unit said: “The costs of renewables and smart power technology are changing much faster than the government predicted [when the Hinkley deal was struck]”. ***The Energy Summit’s chair, BBC broadcaster Roger Harrabin attempted to press EDF Energy’s boss on the number of new nuclear plants he imagines will be built in the UK to support its low carbon future. De Rivaz was evasive. He said, “more will follow” the three nuclear power plants already in EDF’s pipeline: Hinkley Point C, Sizewell C and Bradwell B.
I have quoted both of these items verbatim over at https://notalotofpeopleknowthat.wordpress.com/2017/07/03/28523/ as I know they like to keep an eye on the illustrious Roger Harrabin over there. grateful to u for posting it to Homewood’s site. I know I should spread stuff around. we all should. The last licenses for new wind or solar generation projects were awarded in 2015. An auction for licenses was called off in 2016 and it is unlikely new licenses will be issued this year. Since there is no demand from power distributors to buy power forward, one way to create new projects would be to include them in a government plan to build spare capacity as a way to guarantee supply when demand increases rapidly, Rego said. But since this has a cost that in the end would have to be financed by consumers, there is resistance in the government to carrying such a plan out. Months after reaffirming its commitment in eastern North Carolina, Virginia’s Apex Clean Energy is preparing for the ramifications of a wind moratorium in North Carolina. But, on the downside, the latest Government figures confirm that solar deployment rates remain stalled, with only a 0.2% increase or 25MW – equivalent to five factory roofs – in capacity delivered in the last three months. Chris Hewett, Policy Manager at the Solar Trade Association, said: “The Committee on Climate Change has made is clear that solar power is now cheaper than that generated by fossil fuels. Phew – thank goodness for coal – as yesterday was aphelion, where Earth is the furthest from the sun for the whole year. Oh, and it’s snowing big-time down south too. Double happy! Jo, these reports don’t really support the notion of 3-4 cent coal fired power (seemingly independent of time and coal price/worth) that you have oft cited, in fact the figures are close to double that. They also don’t really support the ‘free market’ approach that we often go on about and the modelling seems to be based on a ‘guaranteed’ market for the energy produced (bit like the blowin’ in the wind fiasco – paid even if we don’t want it). In the ‘free market’ where there is demand then they could expect to sell all of their output, but how does a new ‘free market’ player get into the game unless they actually wait until we have more demand than supply before they build a new station? The modelling seems to rely on ‘brownfield’ developments which would take advantage of all of the existing (pretty much all gov built) supporting infrastructure. The costs are just the builders costs and don’t include things like the cost of the finance – it almost seems like the assumption is that it is all funded on some low cost money from the gov rather than those free marketeers with a lazy $3b lying around that might earn them 20% or so. The modelling also considers the option of using ‘lower cost’ Chinese equipment and you definitely can’t hold up those low costs as the result of a ‘free market’. We could extend the idea of these cost savings and bring in lots of Chinese labour to put it all together if it was not for those lefty unions too. You cite the $2.1b per GW figure from the report but it is interesting that the entire USA has only one example and that cost 60% more than this (per watt). The queensland example did indeed come in cheaper than this but as far as I am aware, this is modern, but not a state of the art station, although I think it probably has good japanese gear and is certainly not on the 2GW scale we often talk about. So it would seem that the only ones building modern coal stations is the lefty queensland government – so how does that square up with the free market thinking? I have not looked at the gas station costs in detail but the report does make it clear that the high cost of power from these stations has a lot to do with the price of gas and not the technology itself. The US relies a lot on gas as I think you do in WA and it would seem that a gas fired station fuelled with government mined ‘free gas’ would be a nice thing too and well suited to ironing out the wild VRE inputs or even mandate the all the VRE suppliers buy into or team up with gas fired stations and present as a single firm supplier to the NEM wearing the input cost fluctuations themselves. Who do we blame for the crazy gas prices other than the ‘free market’? I guess you could blame it on lefty china. Is it right for lefty Malcolm to regulate that export market to force players to be a bit charitable to the local power makers? You publish many comments talking about how the RET accounts for 18 cents of the retail price but I wonder if this is accurate and that prices will drop by 18 cents once that is all a thing of the past. When you look at the other ‘free market’ energy (save a few local taxes) like oil we see our wealthy ‘free marketeers’ reducing production to ‘prop the price of oil up’ as a cartel and that is most often viewed as a good thing for the shareholders. Is that really a good thing for us as car drivers? Can you perhaps explain a bit better the numbers of just how we transition to this ‘free market’ cheap power economy/utopia without the govs interfering in either a beneficial or detrimental way? That is not a rhetorical, but a genuine question. To get the cheapest low carbon electricity you should build Liquid Fluoride Thorium Reactors (LFTRs).